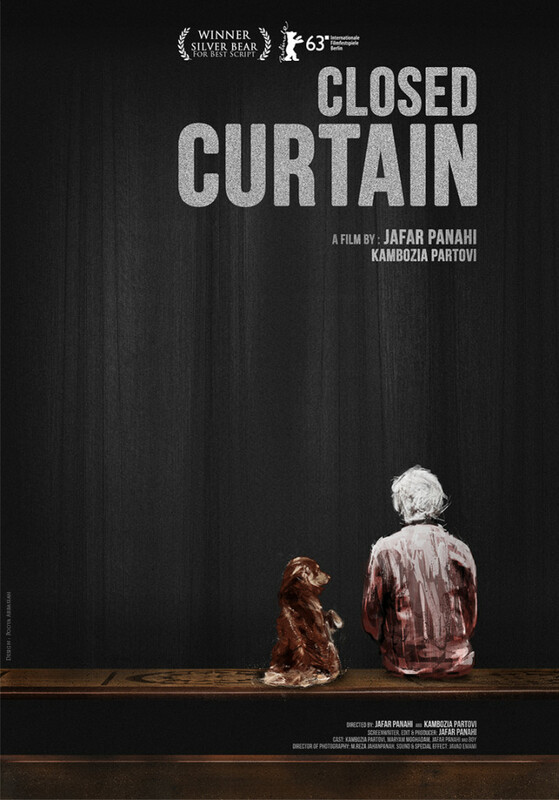 Director and writer Jafar Panahi follows up from This is Not a Film with another film which reflects upon his state imposed restrictions. After having been arrested many times and having a twenty year ban on making films imposed upon him by the Iranian government it cannot be denied that Panahi’s continued filmmaking efforts are both brave and honourable. His last film even had to be smuggled out of the country on a pen drive within a cake in order for it to make the Cannes Film Festival. But the struggle he is engaged does not necessarily allow for great art to be produced and the stifling restrictions imposed upon Panahi are beginning to show in his work, a fact which Closed Curtain seems very much aware of. The film tells the story of a man hiding out from the authorities with his dog. He arrives in the house, blocks out the windows and settles down to write however he is soon disturbed by two individuals who invite their way in to his home in order to also invade the authorities. The stage is set for a potentially fascinating display of tension and political discussion, however instead we get an often lifeless, clunky film in which Panahi cannot leave his own self absorption and situation behind. It’s understandable that he is left only to write about his present situation, however he set the film up to talk about this intelligently and indirectly, but instead lapses into a more obvious confrontation as the film develops. Whilst I would never describe the film as being compelling, it is interesting. The situation which birthed it, the themes it addresses and the style of filmmaking used all make the film worth seeing. Unfortunately as a whole the film is not a good one. It’s narrative feels extremely forced, particularly the method of delivering some exposition via a TV which the dog accidentally turns on by leaning on the remote. It drags, it chooses the less interesting methods by which to tell its story and it generally fails to live up to its potential. Having said that, there are many individual elements here which work well and which demand to be seen and the fact that the film can exist at all is a miniature miracle. Haha thanks Tom, yeah it’s very affecting and endlessly interesting subject matter. It’s a pity this one couldn’t quite deal with it as well as one would have hoped. Sounds really interesting. It’s showing at a few cinemas in London. May try and catch it this weekend. Cheers for the tip. No problem, it’s far from perfect but it has all the right ingredients and it’s never uninteresting providing you know the director’s backstory. ← Competition: Win The Treatment on DVD!